LONDON, 08 April 2019: Results from Bridge India’s first annual diaspora survey show that NRIs and OCIs in the UK would overwhelmingly vote for the BJP if they had the right to vote in Indian elections starting this week. This is the only survey of its kind done in the UK and – to our knowledge – globally, ahead of the Elections to understand how the Indian diaspora would vote. The survey received nearly 350 responses during March this year, mostly from the UK, but also some from across Europe. One-third of the respondents were NRIs, and two-thirds were OCIs. From those that provided a response, 20% identified themselves as left of centre on the political spectrum, 22% as centrist and 29% as right of centre. To the question of how they would vote, if they were able to, in the Indian General Elections starting this week, 62% said they would vote BJP, 24% said Congress, with 8% choosing AAP. Name recognition amongst the regional parties in India was low amongst both NRIs and OCIs. A third of respondents did not wish to say or did not feel they had enough information to make a decision. This was particularly true of OCIs, who felt somewhat connected to India, but did not feel they had sufficient information to have an informed opinion. Amongst the NRIs that responded, 79% said they would vote for the BJP. This reflects a significant mobilisation of NRI support in the UK by the BJP, through a strong grassroots structure built particularly amongst the Gujarati community. However, respondents voiced frustration at not being able to easily vote in the elections. NRIs can currently only vote in Indian elections by travelling back to their constituency to cast their vote, but less than 6% were happy with the status quo. 61% said that they should be allowed to instead vote at their local Consulate or Embassy and 17% said they should be allowed to appoint a proxy to cast their vote for them. More than 60% also strongly agreed with the statement that Indian should be allowed dual citizenship, which is currently not allowed. Bridge India is a new progressive non-profit think tank dedicated to discourse on public policy for the betterment of India, launched in October 2018. It’s first office was established in London, with further European branches in the coming year. It is the first such Indian diaspora think tank in Europe and has sought to engage with stakeholders, policy makers and business leaders through curated events, seminars and though leadership. 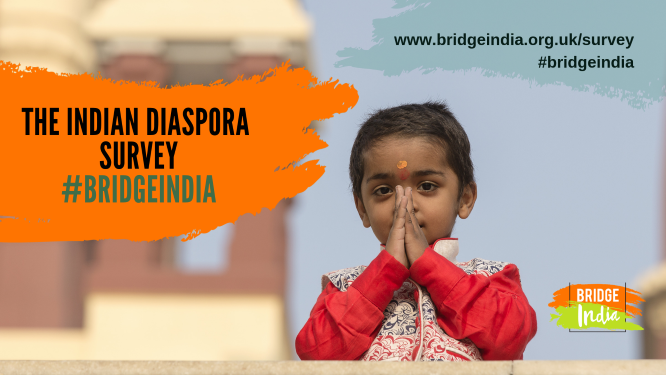 The full results of the diaspora survey, which covered questions around economic development, charity, and wider social engagement between Indian diaspora and India, will be released later in Summer 2019. ABOUT BRIDGE INDIA: Visit www.bridgeindia.org.uk. Bridge India an Indian diaspora think tank that will seek to achieve its objective though the following: provide a space for broad, inclusive and open-minded debate, with a focus on connecting India-watchers and diaspora to India; provide a platform for discourse on public policy and political idea for the betterment of India; and facilitate member debate, conducting research and seminars, with diverse engagement at the heart of everything we do. Since its launch, Bridge India has hosted more than a dozen events for its Members and others to help diaspora and others engage right across the public policy spectrum.